Hey, remember the trivia category? Well, I’m bringing it back. This time, let’s examine who George Macy and the subsequent owners of the Limited Editions Club commissioned the most over the Club’s long tenure! Sauvage illustrated several French classics for the LEC, including Cyrano de Bergerac, The History of Zadig (pictured), and two works of Anatole France, The Crime of Sylvestre Bonnard and At the Sign of the Queen Pedauque. He also handled As You Like It in the LEC Shakespeare. ben Sussan had two commissions of Honore de Balzac, rendering the worlds of Old Goriot and Eugenie Grandet as part of his eight titles for the LEC. He also had a hand in English drama, providing art for Jonson’s Volpone, the Fox and Shakespeare’s The Merchant of Venice. 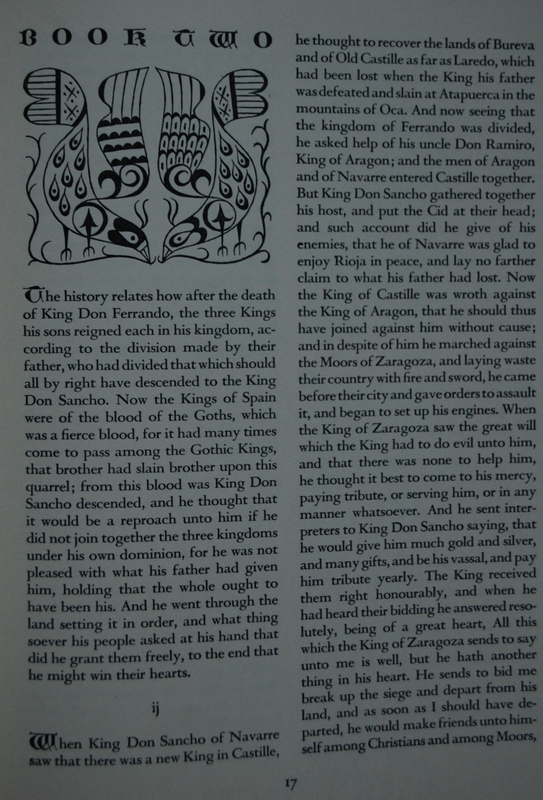 Pictured is The Chronicle of the Cid. Several British works were illustrated by Austen: Vanity Fair (pictured), The Comedy of Errors, The Faerie Queene, The Pickwick Club, and The Adventures of Peregrine Pickle. He also branched out a little with Aristophanes’ The Birds. The sole woman on our list, Parker’s exquisite woodcuts brought life to all of Thomas Hardy’s novels printed by the Club, as well as The Faerie Queene (pictured), Elegy Written in a Country Church-Yard, Richard the Second, and The Poems of Shakespeare. A talented designer as well as artist, Cleland’s artistic gifts were displayed a little less frequently, but often enough to earn a place on our list. Some of his works include The Decameron, The History of Tom Jones, The Way of the World, She Stoops to Conquer and The Life and Times of Tristan Shandy, Gentleman. Pictured is Monsieur Beauclaire. 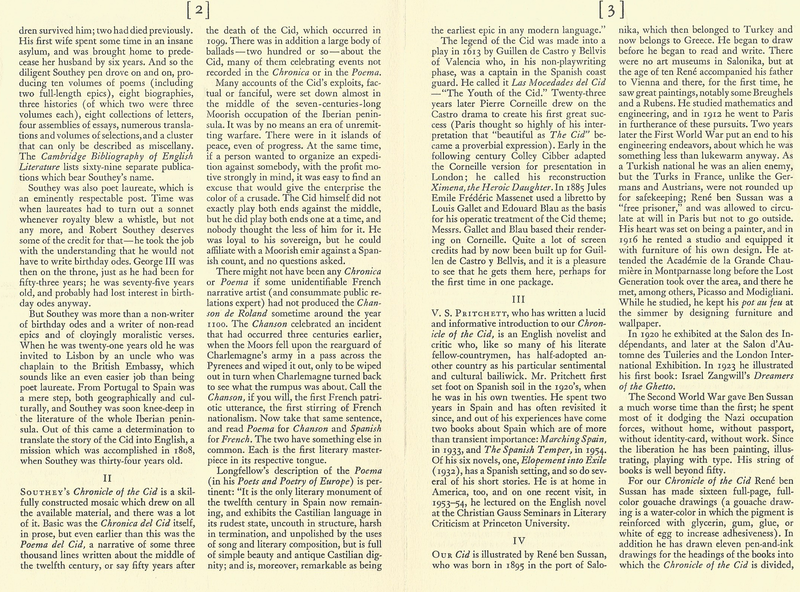 The simplistic yet stylistic grace of Angelo graced a dozen books of the LEC, and several of them are masterworks of literature: The Rubaiyat of Omar Khayyam, The House of the Seven Gables, The Books of a Thousand Nights and a Night, Songs of the Portuguese, and several religious texts, like The Koran, The Book of Proverbs and The Book of Psalms. Pictured is The Song of Roland. Ward’s thirteen contributions mark him as one of the most prominent illustrators for Macy, and he didn’t even work on the LEC Shakespeare like the majority of the others on this list! 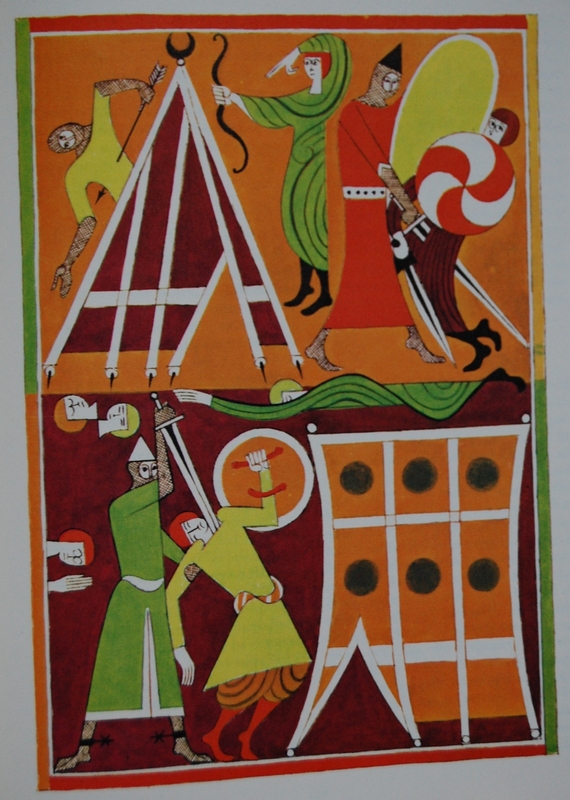 Ward’s commissions ranged from non-fiction works such as Rights of Man and On Conciliation with America to fantastical works such as Beowulf and Idylls of the King to contemporary works like The Innocent Voyage (pictured) and For Whom the Bell Tolls. The gifted Eichenberg worked the longest stretch of any of our artists; his first commission was 1939’s Richard the Third for the LEC Shakespeare to 1986’s The Diary of a Country Priest. One of the few to work under late Club owner Sid Shiff, Eichenberg’s output left the LEC a lasting legacy that is difficult to ignore. Best known for his work on the Russian legends of literature, including Eugene Onegin, Crime and Punishment (pictured), Fathers and Sons, and Childhood, Boyhood, Youth. Wilson was productive, to say the least; he even had his own Heritage volume detailing his artwork! Among the many classics he brought visual splendor to are Westward Ho! (pictured), Treasure Island, The Tempest, Robinson Crusoe, Journey to the Center of the Earth and The Strange Case of Dr. Jekyll and Mr. Hyde. And finally we come to Fritz Kredel, the king of illustrating for the LEC with a massive twenty volumes! 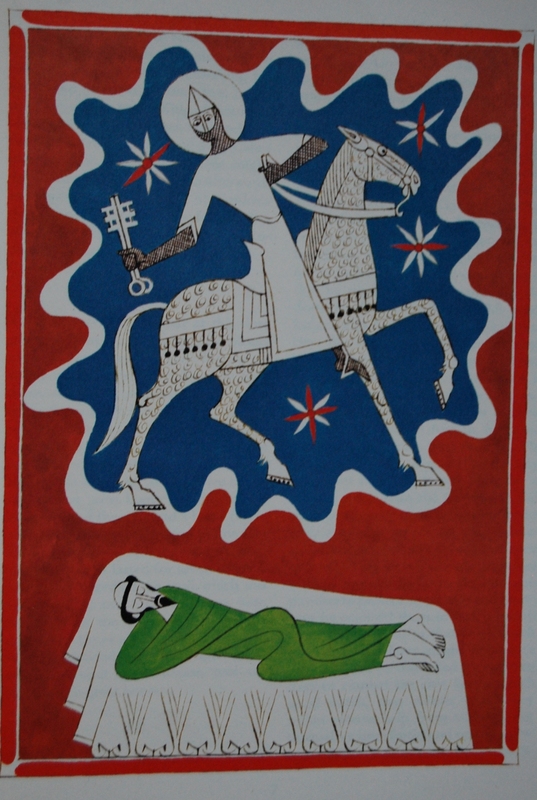 Many collections of fairy tales were conjured by Kredel, including both Andersen (pictured) and the Brothers Grimm. Two Shakespeares, two Trollopes, two Twains, Thackeray, Darwin, Austen, Plato and Heine were among the literary giants Kredel decorated for Macy, and his talent was certainly up to such a diverse palette of books. Next time, we’ll explore the most frequent Heritage Press artists in terms of their exclusives. We’ll see how many of these artisans cross over! 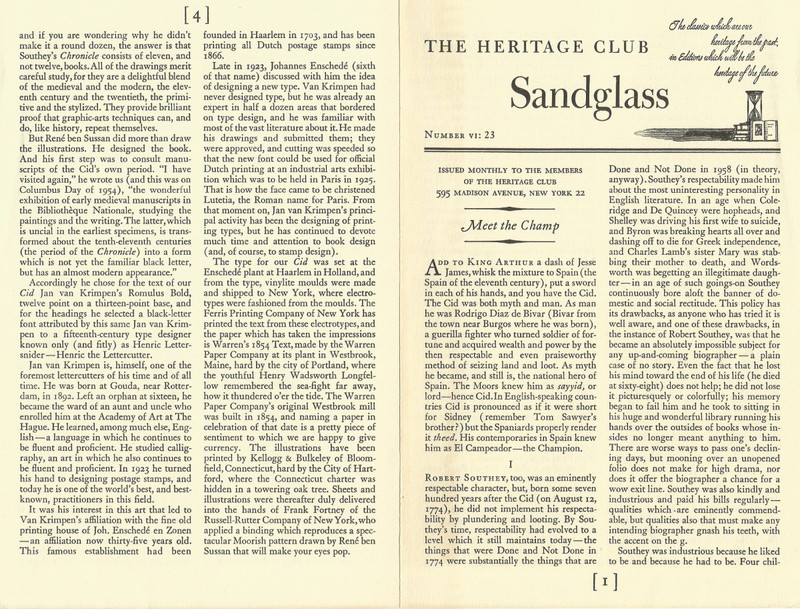 Reprint of LEC #289, 26th Series, V. 10, in 1958. Front Binding – First of all, it’s nice to return to writing about these books. The last few months have been remarkably hectic, stressful and harried. While there are some things I still need to do for my future, I desperately needed an outlet to write. Sharing the beautiful titles George Macy and his family produced is a fine way to accomplish that. Anyway, let’s focus in on The Chronicle of the Cid, our selection for today. The Cid (pronounced “Sid” in English; “Theed” in Spanish) is essentially the Spanish equivalent of King Arthur in terms of hero and myth. 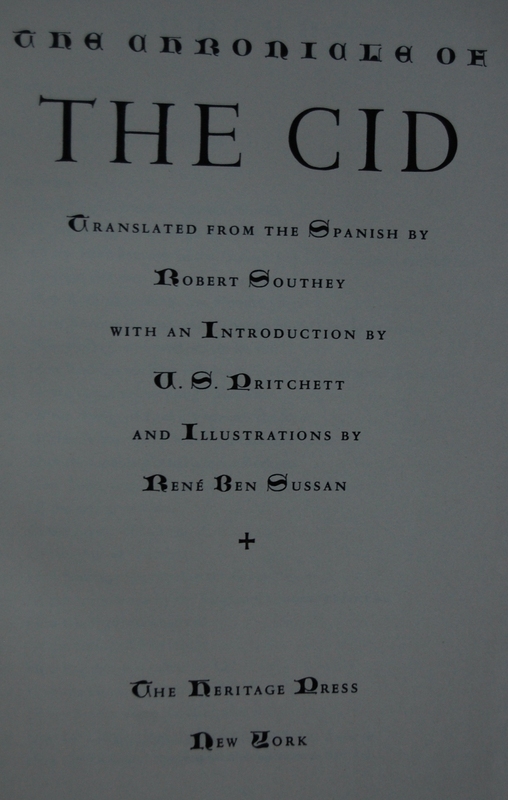 The Spanish legend was rendered into the English language by Robert Southey, a productive (if not exactly prodigious in terms of the modern English pantheon) poet and essayist, which he finished in 1808, some 700 years after the death of The Cid (aka Rodrigo Diaz de Bivar). This was the sole work Southey had produced by the George Macy Company and its subsequent presses. Ben Sussan has a rather distinctive style that, for me at least, can clash with my perceptions of artistic aesthetic. However, I feel that with The Cid his gouache drawings fit in quite nicely with the text. The color choices, linework and blending of medieval and modern sensibilities are wonderfully executed, and out of the books I’ve seen of his art, this is the pinnacle. Design Notes – Ben Sussan also designed the book, utilizing frequent Macy designer Jan van Krimpen’s Romulus Bold as the primary font. This was set at the Enschedé, a printing house in Holland, and the Heritage edition was taken from vinylite moulds of the LEC text by New York’s Ferris Printing Company. The Warren Paper Company of Maine supplied the paper. Ben Sussan’s work was reprinted by Kellogg & Bulkeley of Connecticut, and the books were bound by the ever-present Russell-Rutter Company, who seemingly bound 90% or so of the Heritage Press catalog. 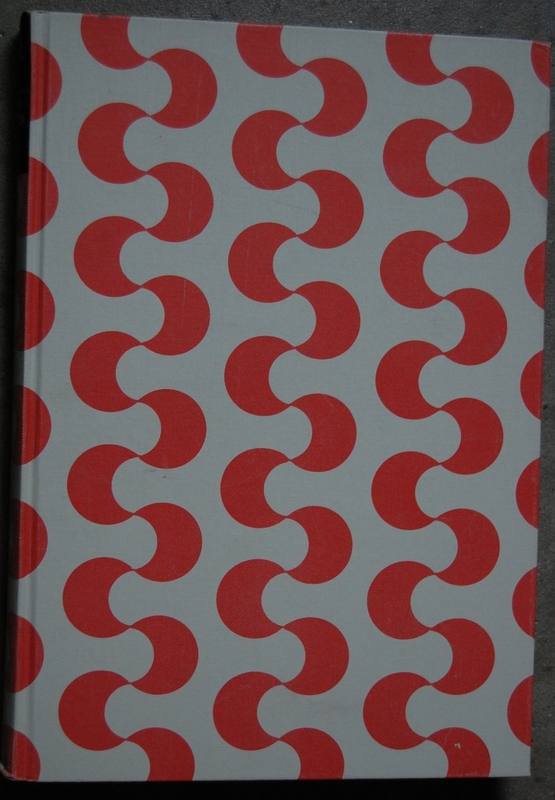 The binding features Ben Sussan’s lovely Moorish pattern that sold me on this book before I even opened it. Title Page – V.S. Pritchett was called upon to write up an introduction. Page 6 – Ben Sussan skirts the styles of traditional medieval art with some modern sensibilities, and it’s quite an effective blending. Page 17 – Ben Sussan also composed header images per chapter. Personal Notes – I purchased this from Bookbuyers in Monterey a few years ago on store credit, if memory serves. The distinctive binding, as I mentioned before, caught my eye. I haven’t gotten around to reading it yet, but the Sandglass does a splendid job of making it sound intriguing! While I’ve yet to cover most of the exquisite LEC Shakespeares, I’ve had a devil of a time trying to find a complete list of the illustrators for the 39 volume set. Well, I’m happy to present to you that very coveted list, in a typed form, so that it’ll be available to LEC collectors looking for books from their favorite illustrators. All of the books were designed by Bruce Rogers. Note that this set is completely unsigned, so that bit of novelty is lost. However, a set of Shakespeare’s poetry followed the release of the plays. 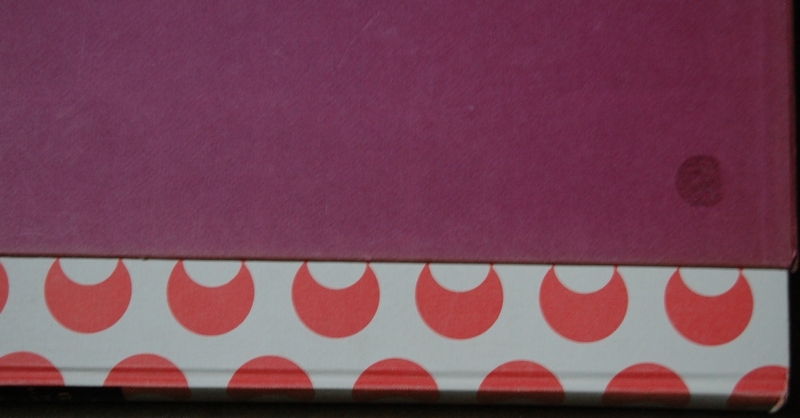 They were deliberately matched to the binding style of the rest, and this one is signed by Rogers. Hope this list aids you somehow or another! You are currently browsing entries tagged with Rene ben Sussan at The George Macy Imagery.